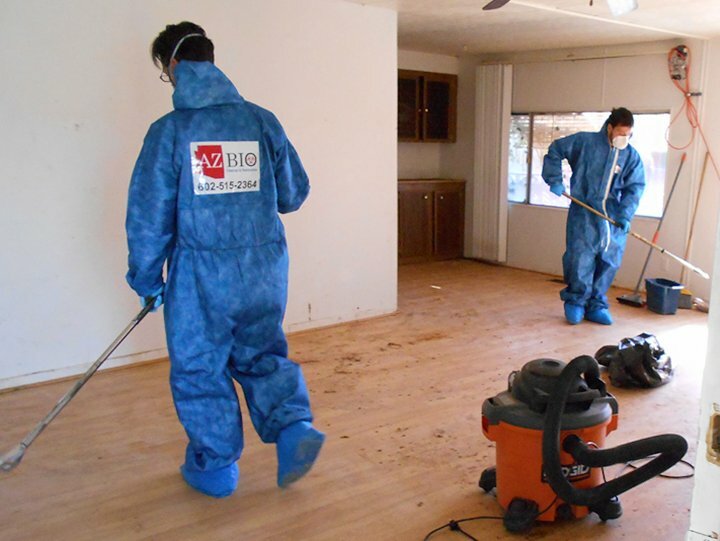 Since 2004 we are certified in Tempe Biohazard Cleanup, Tempe Suicide Cleanup, Crime Scene Cleanup Tempe, Unattended Death Cleanup, Decomposition Cleanup, Blood Cleanup, Infectious Disease Cleanup, Tempe Hoarding Cleanup, Homicide Cleanup Tempe, Bacteria Testing, and Restorations. Well-known by 1st-responders in Arizona, Phoenix, Tucson. By visiting this website, chances are you have just experienced an unfortunate situation that may require our expertise. We understand that your family’s emotions may be shaken and we offer our sincere concerns. At AZ-BIO our company is trained to provide you, and your family, the highest care that our industry offers. We are a locally owned company that understands the need to provide you with professionalism, compassion, understanding, and discrete. We encourage you to take a closer look at our services and we accept your phone calls 24 hours a day. An operator is always available to explain your options by calling to 602-515-2364 (Phoenix) 520-882-4350 (Tucson) . Provide you with well-trained professional technicians committed to acting with diligence and compassion for your unexpected, catastrophic needs. Restoring homes and businesses after a tragic loss or crisis since 2004. Quick response times. We consistently strive for a 2-3 hour on-site response time to your property. Tempe Biohazard Cleanup, Tempe Crime Scene Cleanup, Tempe Hoarding Cleanup, C-DIFF, MRSA, Tempe Homicide Cleanup and Tempe Suicide Cleanup. SERVICES FOR ALL OF ARIZONA INCLUDING: Ahwatukee, Anthem, Apache Junction, Avondale, Buckeye, Casa Grande, Carefree, Cave Creek, Chandler, Coolidge, Cottonwood, Eloy, El Mirage, Flagstaff, Florence, Fountain Hills, Gila Bend, Gilbert, Glendale, Globe, Gold Canyon, Goodyear, Green Valley, Guadalupe, Kearney, Lake Havasu, Litchfield Park, Mammoth, Maricopa, Mesa, Miami, Paradise Valley, Payson, Peoria, Phoenix, Pinal County, Pinetop, Paradise Valley, Prescott, Queen Creek, Scottsdale, Sedona, Showlow, Sierra Vista, Sun City, Sun City West, Sun Lakes, Superior, Surprise, Tempe, Tolleson, Tucson, Wickenburg, Williams, Youngtown & surrounding areas within Arizona.